ePublishing Knowledge BaseePublishing Knowledge BaseePublishing Knowledge Base Presenting Related Articles, Posts How do I add topics/categories to my website's taxonomy? 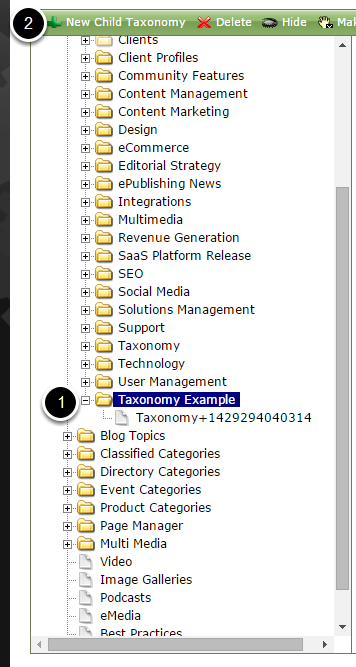 The Topic/Category taxonomy is fed by your Taxonomy Manager. These are used to tag your content with relevant content. For example, if you tag your article on Twitter best practices with the topic "Social Media," it would then automatically be included on the topic page for that taxonomy on your website. The Topic/Category taxonomy is different from the Site Placement and Classification taxonomies. This article will show you how to add new topics or categories to your website's taxonomy. Option 1: In your article or blog post, select Add Topic/Category under Topic/Category. Zoom: Option 1: In your article or blog post, select Add Topic/Category under Topic/Category. In articles, this can be found under the Supplemental tab. In blog posts, this can be found on the General tab. Type your new topic or category under Title and a description, if desired. Zoom: Type your new topic or category under Title and a description, if desired. 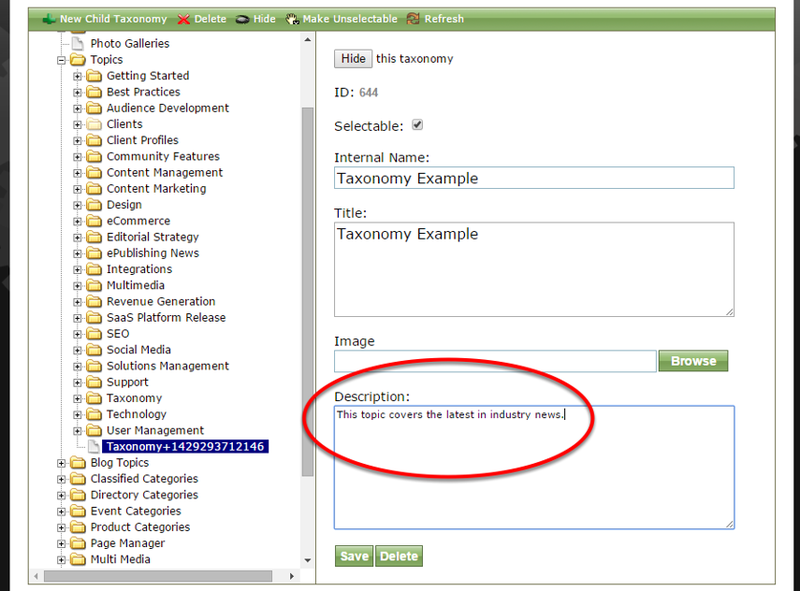 Your topic/category will default to "selectable," which means you can select it as a new taxonomy tag for your content. When you click Create, you will be taken back to your article or blog post and that new topic will automatically be selected. Zoom: When you click Create, you will be taken back to your article or blog post and that new topic will automatically be selected. To deselect it, click the checkmark next to the topic. Option 2: Add the topic/category within your Taxonomy Manager. 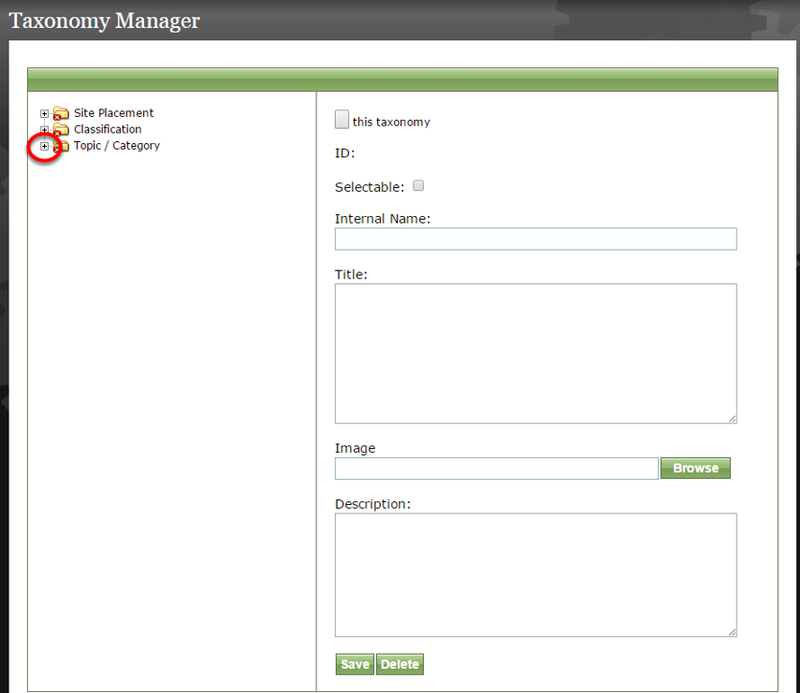 Under Editorial on your dashboard, select Manage Taxonomy next to Taxonomy. 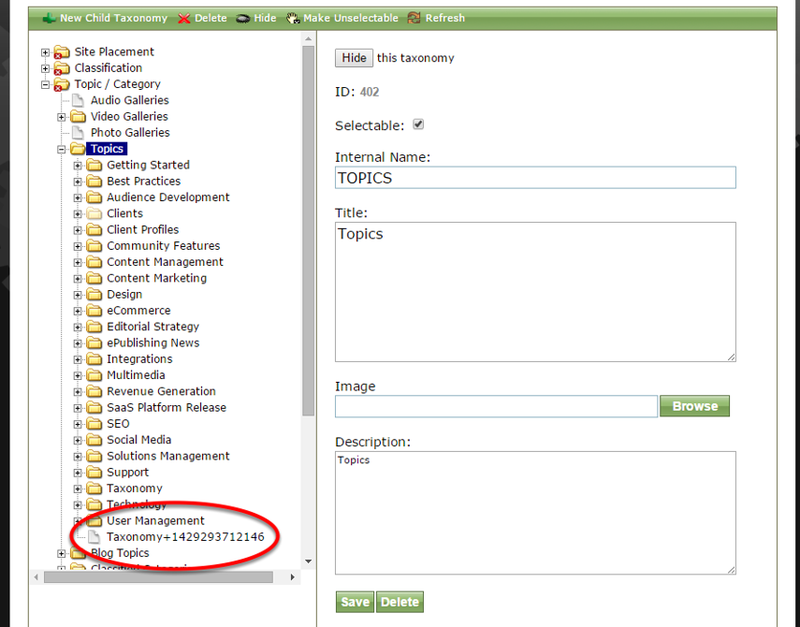 Or in the Supplemental section of editing an article or blog post, select Topic/Category Manager. Zoom: Or in the Supplemental section of editing an article or blog post, select Topic/Category Manager. 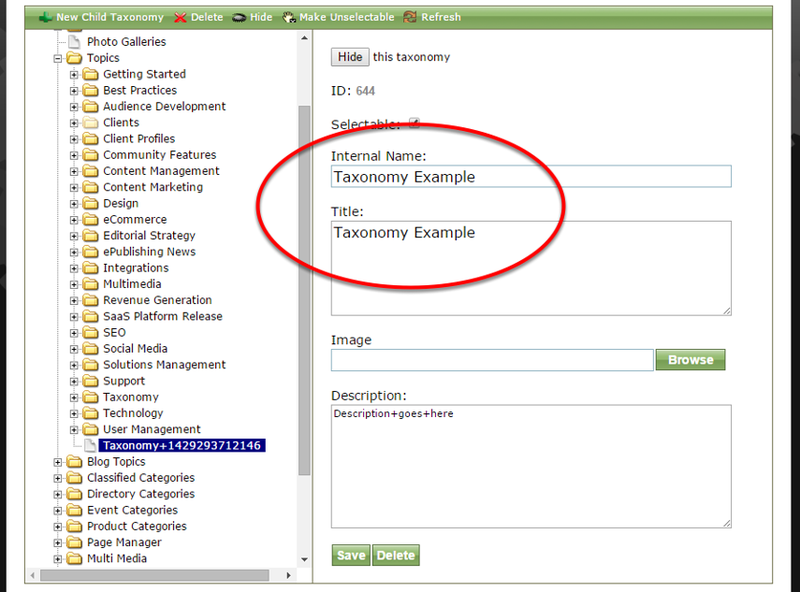 In your Taxonomy Manager, select the plus sign (circled) next to Topic/Category to expand. 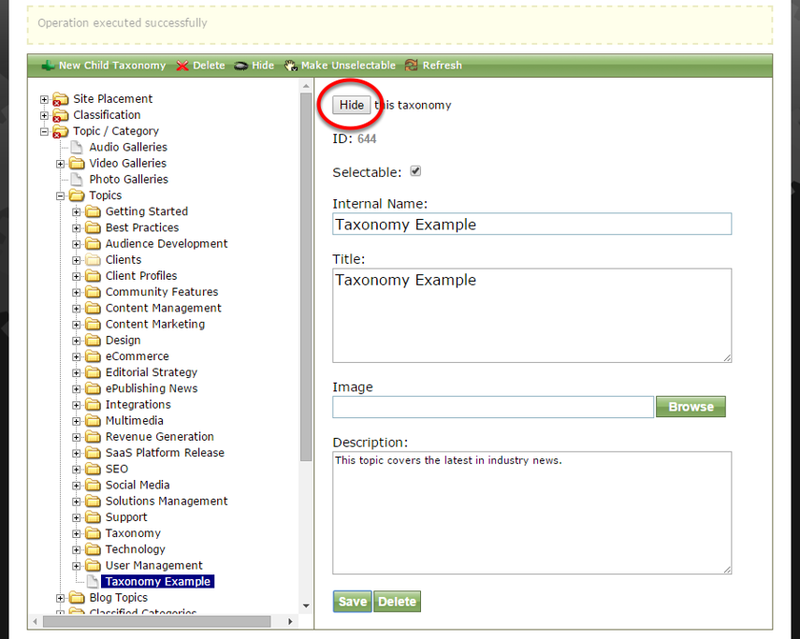 Zoom: In your Taxonomy Manager, select the plus sign (circled) next to Topic/Category to expand. To add a new topic or category, select the folder in which you want the new topic to appear and then New Child Taxonomy (2). Zoom: To add a new topic or category, select the folder in which you want the new topic to appear and then New Child Taxonomy (2). First expand the folder you want the new topic to appear under if needed. A new Taxonomy will appear within the folder. Zoom: A new Taxonomy will appear within the folder. Click on the new Taxonomy and type your new topic or category under Internal Name and Title on the right. Zoom: Click on the new Taxonomy and type your new topic or category under Internal Name and Title on the right. Add a description. This will appear on all index pages for topics/categories on your website. Zoom: Add a description. This will appear on all index pages for topics/categories on your website. If you would like to assign it to an article or blog post, return and select the new topic/category. If you don't want your new topic/category to appear live on your website, click Hide. Zoom: If you don't want your new topic/category to appear live on your website, click Hide. To add subtopics within your new topic or category, click on the new topic (1) and select New Child Taxonomy (2) and follow the directions in this article. To display a topic/category that was previously hidden, click Display after clicking on your topic/category. Zoom: To display a topic/category that was previously hidden, click Display after clicking on your topic/category. 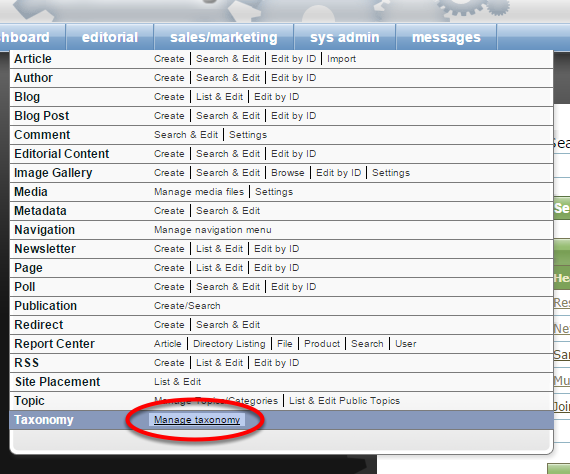 To delete a topic/category, select your topic/category and click Delete at the top of the Taxonomy Manager. 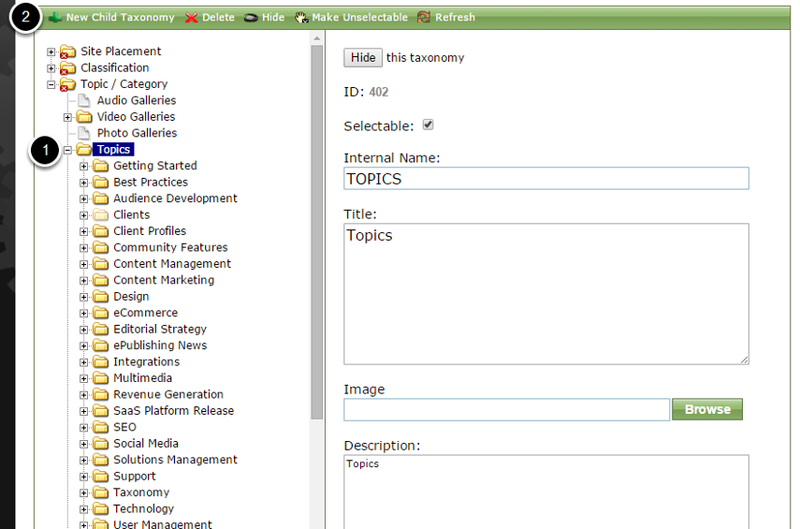 Zoom: To delete a topic/category, select your topic/category and click Delete at the top of the Taxonomy Manager. Prev: How do I select related articles, blog posts, listings, events, products and more to appear next to my content? Next: How do I create topic links on article pages?